Mithra was born on the longest night of the Year. 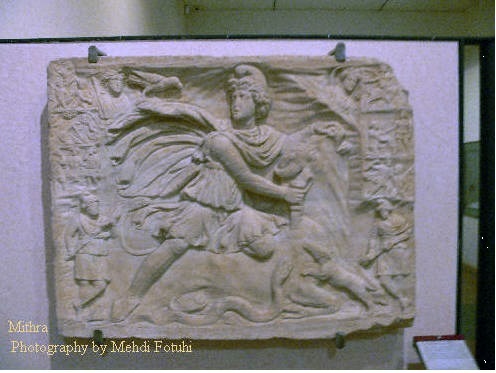 Mithraism originated in the Eastern part of today's Iran around the 7th century Before Christ (BC). It also was practiced in the Roman Empire since the first century BC., and culminated around the third through fourth centuries after Christ (AD), when it became very popular among the Roman soldiers. Mithraism disappeared from overt practice after the Theodosian decree of 391 AD, which banned all pagan rites, and it apparently became extinct thereafter. A philosophy was then believed to be that the world was based on energy and the known closest energy to Earth was the Sun. In every Mithraic temple, (Spread out in Europe of today, i.e. 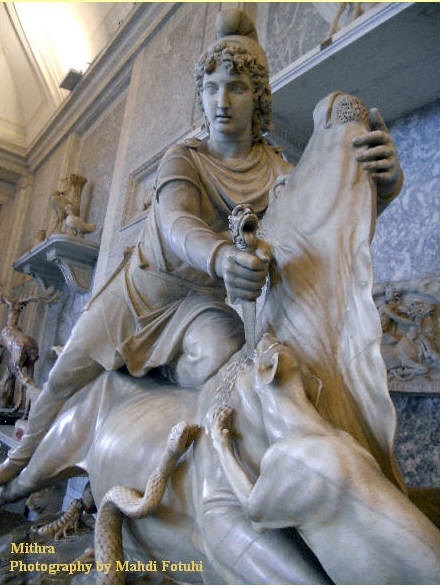 Belgium, England, Germany, France and Italy), the place of honor was occupied by an effigy of Mithra killing a sacred bull, called a Tauroctony. Iranians believed that in Tauroctony the bull is sitting on the nutriment of land. The ancient Iranians believed in the purity of humans. Good thoughts, good words and good deeds were the basis of purity and energy. It was believed that the union of Moon and Sun gave birth to Mithra in a “stone”! The stone may have been the symbol that Christians used as a stone-cavern for Christ! As for the Virgin Mary, it is in the legends that Zoroaster (Zartusht) bathed in a lake north of Iran (Aral sea, according to some! ), where his seeds are conserved till a young virgin bathes in it and conceives with those seeds! The child that is born will be the last "human", before the seen and the unseen world join! Mithraic beliefs in Europe emerged side by side with Christianity for two centuries, both of which moved up to England. 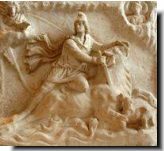 The Mithraic influence was about to make the Christianity fade away by 391 AD. 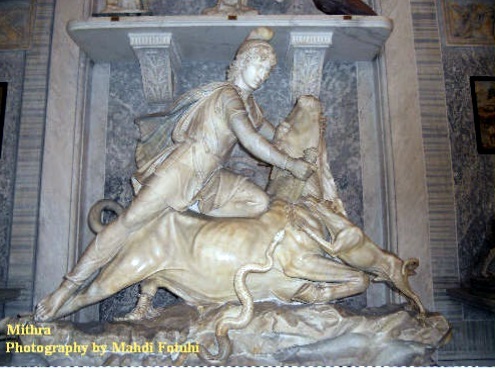 Mithraism’s great teachings and true basics worried the Catholic churches. 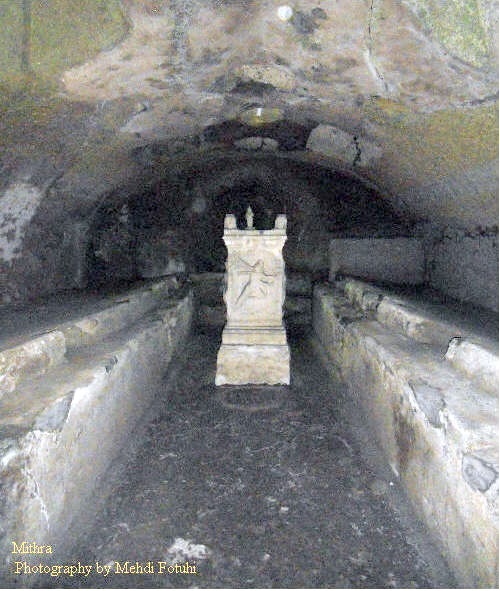 The said effigies and many similar sketches in most European churches, including Vatican, attest to the influence of Mithra. It is believed that Vatican was built on a major Mithratic temple in order to hide the evidences. 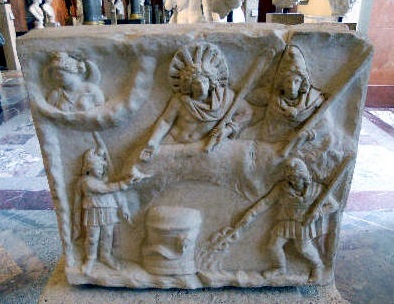 Mithraism became known to Romans 70 years prior to Christianity. They maintained Mithraism as their official religion until 370 AD. Following emergence of Christianity in Rome and ancient Greece, yet many religiously worshiped and practiced Mithraic teachings. Constantine of Rome in 325 AD developed some sympathy toward Christianity and distanced himself from Mithraism. While he was pushing his nation toward Christianity, he died without abandoning his basic Mithraic beliefs. 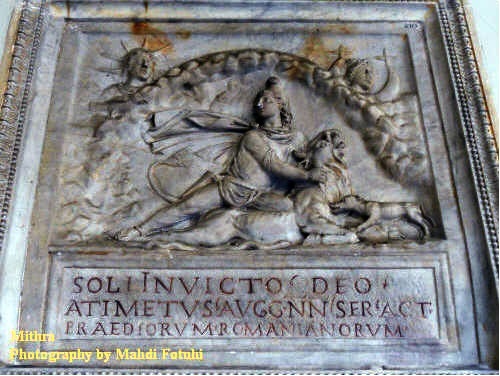 His son who was in love with Mithraism, its great philosophy, humanitarian traditions, love of nature and festive life all year round, brought Mithraism back, but his short life did not permit him to complete his intended task of making Mitharism the official religion of Rome. Perhaps if he had not died so early, today the dominant religion of the world would have been something different from Christianity. 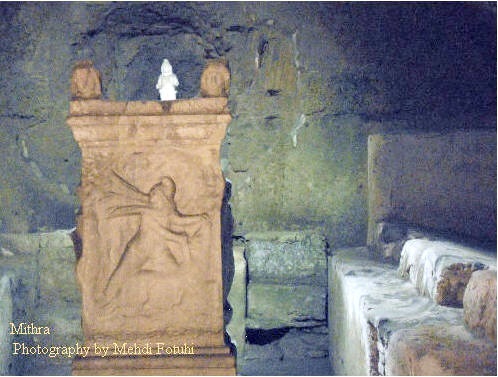 Mithraism and Christianity were practiced side by side until 12th Century, at a time when Catholic churches thought of killing Mithraism by taking away the festive traditions and cherished living. They however adopted the names of weekdays. In ancient Iran, every day of the month was named after an astronomical planet and star, such as Moon, Sun, etc. Any day that matched with the name of a month was a festive day. Sunday that had something to do with their belief in the energy coming down from Sun, in Mithra’s teaching was called “a rest day”. Greeks and Romans incorporated the same name(s) in their weekdays and called It Sunday; or Monday as derived from Moon. It was in 12th century that churches adopted the story to create Christ from a "Virgin". They turned Mithra’s belief "Last Human before the seen and the unseen" into the return of Christ at the end of times and included same in gospels. Muslims took the same story to fabricate their funniest, the most horrible and nonexistent man in the world, namely “Mehdi”, living at the bottom of a "well" for over 1000 years, who is supposed to return with a sword to massacre the unbelievers until their blood rises up to his knees, thus, justice be served in favor of the believers! The time lapse between such purity to this stupidity was only 2500 Years.. According to the Iranian legends/myths it is believed that Mithra was born at the longest night of the year, called "Yalda" Yalda, in the Seriany and Assyrian dialect of Iran means “Birth”. At the time the Christian churches agreed to repel Mithra by replacing “Mir Now-Roozi” (a man with a happy face and in red outfit, appearing during festive times in Equinox= Spring) by a jolly man called “Santa Claus” or “Papa Noel”. They made sure to have Christ’s birth from Virgin Mary fall on a day close to the "longest night of the year". If one focuses on Mithraism, Judaism and Christianity it is easy to conclude that both latter religions are influenced by Mithraism. Therefore, it is not strange to notice some remaining traditions to still exist in some locations around Europe imitating that of Iranian’s and in some cases to be a carbon copy. 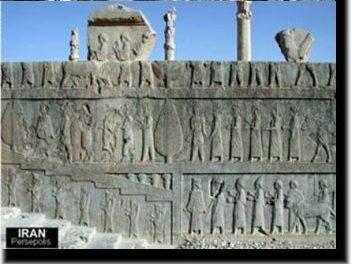 As it is shown in the above carved stone steps of Appadana Palace (Persepolis- Shiraz – Iran) the Cypress Tree has been part of Mithraism to keep the environment at its utmost purity. The Cypress during emergence of Santa Claus and Christmas (12th Century) has been turned into Pine with shining star (symbol of Sun in the Mithraism) on top of it; because Cypress did not grow in Europe at the time. The above picture shows Now-Rooz Celebration and arrival of the representatives of various nations into the Kingdom and paying tribute to the King of Kings. It is not strange to notice that the same word "King" is also used in most Judaic and Christian holy books. 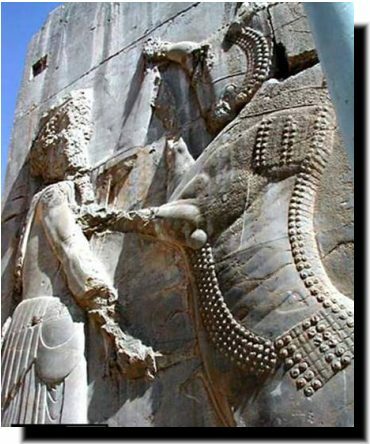 If one examines the Cyrus the Great Cylinder, one can easily conclude that how important the "Humanity" was in the Ancient Iran. This cylinder is sitting in the British Museum, whereas a replica of it is posted on the third floor hallway of the United Nations, where all delegates pass by before entering the assembly hall. -Anno Domini (Latin: "In the year of (Our) Lord"), abbreviated as AD, defines an epoch based on the traditionally-reckoned year of the conception or birth of Jesus of Nazareth. Similarly, Before Christ (from the Ancient Greek "Christos" or "Anointed One", referring to Jesus), abbreviated as BC, is used in the English language to denote years before the start of this epoch. تاريخ ايران گواه است که مشعل ملی ريش آنانی را که در هر زمان قصد خاموش کردن چراغ و مشعل هويت و فرهنگ ايران زمين را کرده اند را سوزانده است. نه تنها ريش اين اخوش ها سوخته است بلکه ناگزير شده اند واژه تسليم را در برابر ژرفای فرهنگ ايرانی به زبان آورند. دور نرويم، همين دشمنان تجدد و آزادی خواهی و فرهنگ سوزان کنونی را که مانند تازيان کتاب سوز بر مرز و بوم آزاد زنان و آزاد مردان فرمان می رانند و فرهنگ ما را به اسارت کشيده اند را بنگريد. ناگفته پيداست که تمامی تلاش های مذبوحانه فرهنگ ستيزی آنان برای محو ونابودی هويت فرهنگی ما با شکست روبرو شده است. نسل جوان و روشن انديش و خانواده هائی که مليت خويش را فراموش نکرده اند بيهوده بودن و شکست خوردن حاکمان کنونی را که اميد به نابودی جشنهای ملی ايرانيان چون "اميد"، "نوروز"، "چهارشنبه سوری" ، "مهرگان" و "يلدا" بسته اند، را ناظر بوده اند. ملت ايران بطورمنسجم کمر به پايداری و پاسداشت اين شاد باشی ها زده و قصد کرده است تا ريشه غم و انده را از گاهنامه ها و روز نگار ها بزدايد. اين نسل از ايرانيان همانند گذشتگانشان با رشادت تمام بر سنت های فرهنگی شان سپر افکنده اند، و قصد فراموش کردن آنرا ندارند. افروختن "آتش اميد" يکی از شاد باشی های باستان است که در طولانی ترين شب سال يعنی در بزرگداشت شب يلدا شب زايش مهر برپا ميگرديد. روشنائی و گرمای شعله های اين آتش، که در سنن باستانی بصورت مشعل در دل طولانی ترين و سياه ترين شب سال بر افروخته ميشد؛ راه زايش دوباره ميترا را که در روشنی فردايش و صبح روشنش مهر را بهمراه ميآورد را روشن ميسازد. يلدا واژه ای است سريانی که معنی زايش و به ميدان در آمدن را يدک ميکشد؛ در زبان تازی اين واژه به "ميلاد" مبدل شده و در زبان رومی نوئل و يا ناتاليس آمده که آنهم به معنای زايش و يا تولد است. تا چند سد سال پس از زايش مسيح که هنوز شاد باشی ها و شاد خوری های ميترا در اروپا رواج داشت کليسای مسيحی را به نگرانی وا داشت و در صدد از بين بردن آن بر آمدند. در اواسط قرن چهارم ميلادی کليسا که ديگر توانش از گرايش مردم به اين مراسم و فرهنگ که زمين و آسمانرا نور افشان ميکردند طاق شده بود، آن را به زايش مسيح نسبت دادند چون در آن سال بدليل سال های کبيسه با روز بيست و پنجم ماه ميلادی يعنی دسامبر برابر شد. ناگهان برای اولين بار روز زايش مسيح چهار قرن پس از زايشش مشخص شد. ميتولوژی ايرانی بر اين باور است که ظهور اهريمن و تاريکی در اين شب بر ميترا که نماد روشنائی، نور و يا مهراست صورت می گيرد. ميترا که ايزد دوستی، مهر، روشنی، صفا، صلح و برابری است نباید که در اين شب تنها بماند. برای فروزان نمودن اين شب ميبايست که روشن بود، نوشيد و شاد خوری و شادی کرد تا ميترا تا سپيده بامداد در تنهائی بسر نکند. يلدا جشن اميد است و جشن پيروزی نور بر ظلمت، باستانيان گرد هم می آمدند تا گل های دوستی و شفقت بشکفد. در ايران باستان انسان ارزش والا داشته و بر اين بنيان سترونی سرما و تاريکی شب به همراه شادی انسان ها به روشنی، مهر و گرما مبدل ميگردد. ما ايرانيان در پاسخ به فرهنگ ستيزی تازيان و بيگانگان با شاد باشی های ايرانی تمام اين جشن ها را با شکوه و جلوه هرچه بيشتر بر پا خواهيم داشت. تا برای هزارمين بار ريش فوت کنندگان مشعل آزادی، مهر، صلح و روشنی بسوزد. هرچه باشد، ميترا نماد «خورشيد» است. نماد مهر و نماد دوستی می باشد. ميترا در فلسفه هند در قالب پرستش خورشيد جای ميگيرد. در هند نماد تندرستی و سلامت هم بحساب می آيد. به آن به عنوان سمبلی از پيشکشی از آتش نگاه می کنند. ميترا بيشتر به عنوان بهترين جدا شده از هرگونه گناه و بيماری بحساب می آيد، درواقع اورا بهترين وماهرترين جنگجو می شناسند. همانند بسياری از خدايان، ميترا درمقامی بالاتر در قالب روشنایی و قدرت در پشت خورشيد بحساب می آيد. در بابل ميترا بصورت «خدای خورشيد» در قالب نام «شاماش» پديدار میشود. همچنين زيباترين، در ميان فنيقی ها و تمدن های ميان دو رود ميترا نماد «خدای خورشيد» است. او همانند مردوک، خدای بابلی ها بشمار میرود که هم سياره ژوپيتر و هم خورشيد را نمايندگی میکند. به روايت «سيدو-کلمنت در مناظره روم با آپيون، ميترا در مقام آپولو جای ميگيرد.» (هميلی VI ch. X). در ميان ايرانيان ميترا و ميتراييسم بيشتر به ستاره شناسی ظريف و ژرف در فضا توجه می کند و يافته های او بصورت معجزه جلوه گری می کند. درواقع راهبانی که به اينکار مشغولند «مگی Magi» خوانده می شوند و واژه (مجيک Magic) از آنجا مورد مصرف پيدا میکند. ستاره شناسی و شناخت آسمان ودرواقع شناخت خورشيد وتاکيد بر اين دانش «ميترا» نام ميگيرد. ميترا در بنيان خود خورشيد است و هزاران نگاره هایی که از سوی بازديد کننده ها بجا گذاشته شده است نمادی از خورشيد تسخير نشده بنام ميترا را نشان میدهد. در زبان يونانی کهکشان خورشيدی تسخير نشده، ميترا (نومن Numen) نام ميگيرد که به ميترا (خدای خورشيد) (Deus) نام ميگيرد که تمام پاکان ونگاهدارنده ها بنام راهبان يا (Sacerdotes) و به اصطلاح نمازگزاران يا پرستندگان (Cultores) و معبد ها با نام (Templum) که امروز هم «تمپل» خوانده می شود مورد مصرف فرهنگی پيدا میکند. اين نشان میدهد بدون شک رومی ها در دوران باستان دين يا پرستش «ميترا» را بسيار جدی مگرفتند و آنرا (Mithras) می خواندند که به دوران گرگو رومن برميگردد. او آنرا «خورشيد الهی، خورشيد شکست ناپذير» می خواند. گفته شده است او يک پادشاه بسيار مهربان و دوست داشتنی بوده است. وی پادشاه (خورشيد) نام گرفته بود. همچنين ميترا واسطه ای بين بهشت و زمين بوده است. آنچه مسلم است در 80 تا 100 سال پيش از زايش ترسا، رومی ها به «تنها شکست ناپذير، ميترا» اعتقاد داشتند که خورشيد در پشت آن بود. دکتر ريچارد ل. گوردون پروفسور شناخت دين ومذهب در دانشگاه ارفورت براين باور است که يک دين همه گير در قالب «ميترای شکست ناپذير» به ميان آمده و ميترا نام گرفته است. (برگ 732). او اين داده ها را بر آگاهی هایی استوار میکند که از سوی پوزيدونيوس (135- 51 پيش از ترسا) يا آپولودوس (دهه نخست قرن نخست) بيان شده است. او اضافه میکند، دين رومی ها بنظر میرسد موجوديت خودرا از چيزی که در شرق موجود بوده گرفته اندو به آن روش های خودرا افزوده اند. استاد ميترايسم، دکتر راجر بک، می گويد: ميترا نخستين رهرو، بازيگری اصلی، وصحنه مقدسی بوده است که گردن بريدن گاو را رواج داده است. او همچنين نماد خورشيد شکست ناپذير است. (2004 برگ 274). گويا در سنگ نگاره های باستان نماد ميترا خورشيدی بوده است که روی ارابه ای قرار دارد و شش اسب سفيد آنرا می کشند. از همينجا است که روايت (6:2، 19:11) در مذهب ترسایی میگويد عيسی با اسب سفيد بر ميگردد. بنا به نوشته های تاريخنگار رومی پلوتارک (46 – 120 پس از ترسایی) ميتراييسم از سوی رومی ها کاملا جذب وبه زندگی لشگريان وارتش روم وارد شد. اين آيين در گذشت زمان از آسيای کوچک توسط سربازان و افراد نظامی که همه آنها شهروندان روم بحساب می آمدند واز جمله بازرگانان به شهر های بزرگ از جمله اسکندريه، رم، کارتاژ، وديگر شهر های اروپایی آورده شد. حتا به روستا ها نيز سرايت کرد. در سده سوم، ميتراييسم بطور معجزه آسایی تمام امپراتوری روم را پوشاند و آن زمان از هند تا اسکاتلند مردم به روش های ميترا رفتار میکردند. از اينرو است که شايد بيش از 420 مرکز که نماينده برگزاری آيين های ميترایی بوده اند در اروپا وجود دارد. بسياری از آثار بدست آمده، که شامل کوزه و کاسه هایی که در معبد ها بکار میرفته اند آثار ميترا برروی آنها کنده کاری شده اند. از آثار بدست آمده میتوان به جرات گفت اين آيين 80- 100 سال پيش از ميلاد مسيح در سرتاسر منطقه رواج داشته است. ميتراييسم در بين سده دوم و سوم به اوج خود رسيد و در اواخر سده چهارم و آغاز سده پنجم است که کم کم آثار آن کمتر می شود. آنهم به اين دليل که امپراتوری که پيرو ميتراييسم بود می ميرد و جانشين او شخصی است که طرفدار دين مسيح (ترسا) است. آيين ميترا در ميان امپراتوران؛ سياستمداران؛ بازرگانان و سربازان و افسران ارتش رواج داشت. براستی که پيش از نفوذ مسيحيت و جايگزين شدن بجای ميتراييسم بالاترين باورمندان را داشت. آيين ايرانی ميترا و فرهنگ ميترا تمام روم را فرا ميگيرد. گرچه برخی به آيين های ديگری باور دارند ولی در سرتاسر يونان و امپراتوری روم مردم هنوز از فرهنگ ميترا متاثر هستند. دکتر فرانتز کومونت در قرن 20 براين باور است که تئوری «ادامه و پيگيری» که از فرهنگ ايرانی در قالب ميترا پرورش يافته است تمام روم را در بر ميگيرد. آنچه پلوتارک در (زندگی پمپئی برگ 24) آورده است نشان میدهد هنوز در زمان حاضر ميترا طرفداران و باورمندانی در سرزمين هایی که به مسيحيان نسبت می دهند وجود دارند. نويسنده نامی «پروفيری 234 – 305 پس از ترسا» اقرار میکند که آنچه در قالب ميتراييسم در روم به عنوان آيين برتر بکار ميرفت از داده ها و آموزه های زرتشت گرفته شده بود. تشابهی که بين مراسم ميترایی در سرتاسر جهانی که امروز جهان مسيحيت نام گرفته است با مراسمی که بنام مراسم کريستمس برگزار می شود بقدری زياد است که حتا عنوان «پدر» به کشيش کليسا از داده های ميترا آمده است. در درازای قرن ها وسده ها بسياری حتا مدعی شده اند که ميترا از مراسم مسيحی کپی برداری کرده است. درحاليکه مسلم است که 25 دسامبر از ميتراييسم برگرفته شده. سر آرتور ويگال می گويد: «25 دسامبر به راستی روز زايش مسيح نبود. اما روز خدای خورشيد ميترا بود. بهرحال زايش ميترا در 25 دسامبر، گرچه از سوی دنيای کاتوليک مدعی آن هستند، ولی زايش ميترا را مشخص میکند. دايره المعارف کاتوليک خود به 25 دسامبر بعنوان زايش «فرزند خورشيد» اشاره دارد. و آنرا زايش خورشيد زمستانی قلمداد میکند. باوجود اين، چنين روزی بسيار مورد چالش قرار گرفته زيرا نه برای اثبات زايش مسيح ونه برای ميترا سنگ نگاره های باستانشناسی که نشان از چنين واقعه ای داشته باشد در دست نيست. ولی ميدانيم ميترا در چنين روزی زاده شده است. لااقل برای اثبات وجودی ميتراييسم سنگ نگاره ها و مجسمه هایی در معابد و کليسا های مسيحی در سرتاسر اروپا وجود دارد که به وجود ميترا دلالت دارد ولی سندی بر وجودی عيسی و زايش او در چنين شبی در دست نيست. آنچه غيرقابل انکار است اينکه بسيار پيش از آنکه «ميترا» اثرات «رومی» بخود بگيرد مردم ايران در زمستان جشن هایی برپا ميکردند که در ديگر فرهنگ هاهم بی تاثير نبود. در اين راستا جشنی در ايران برپا میشد که با ماه نوامبر ودسامبر (امروز) همزمانی پيدا میکرد، زمانی بود که جشن «سده» که به زرتشتی ها نسبت داده میشد در اين موقع سال برگزار میشد، البته ميدانيم پيش از زرتشت نيز چنين جشنی مرسوم بوده است. جشن «سده» در فضای باز از برای قدرت بخشيدن به آتش، خورشيد که در زمستان نيروی آن کم می شد برگزار میشد. آتش وخورشيد در آيين های ايرانی بسيار با ارزش و دارای معنی ويژه ای است. در آيين های پيشينيان ايران ازجمله در دوران ماد ها نيز برگزار می شده است. جشنی که آريایی ها باخود به سرزمين ايران آورده اند. سده برگزاری پرخوری و ريخت و پاش در پاسداشت آفتاب و آتش نيست، بلکه از برای قدرت بخشيدن و تجديد نيروی آتش و خورشيد در ماه های زمستان است. (دکتر بويس 1982 برگ 25-25). يلدا جشن ديگری است که در ايرانزمين و در ميان ميتراييست ها برگزار می شود. باورمندان به ميترا، بر اين باورند که در اين شب ميترا، خورشيد مهر، زاده شده است. ميترا را خدای راستی ها و روشنایی ميدانند. دربلند ترين شب سال تا به سرزدن خورشيد ميترا از مادری بکر زاده میشود. در چنين شبی در آيين زرتشت براين باور بودند که بد شانسی ها از مردم دوری می گيرند. در شب يلدا که بسيار در گاهنامه ايرانی پر اهميت است مردم جشن «خورشيد و آتش» بپا ميکردند که نشان سلامتی؛ روشنایی و قدرت در روی کره زمين است. يلدا واژه ای سيرانی است به چم زايش. باورمندان به آيين ميترا واژه «يلدا» را بکار میبرند زيرا به زايش ميترا مربوط می شد. افزون بر شب زايش ميترا، شبی است که از فردای آن درازای روز ها بيشتر شده و از درازای شب کاسته می شود. فرتور های زير نماد هایی از ميترا است که در بيش از 420 معبد، کليسا ويا زيارتگاه هایی که تا اسکاتلند کشيده شده بودند ساخته و مورد ستايش بوده اند. برخی براين باورند که در انبار های سری کاخ واتيکان نمونه های فراوانی از نماد ميترا موجود است که بصورت سری نگاهداری میشوند. نه جشن کريسمس بلکه يلدا و شب ميترا را تا ايران زنده است جشن خواهيم گرفت. نخست در سال 2003 نوشته شد. در سال 2011 بازنگری شد. در روز 16 دسامبر 2014 بخش های مربوط به تاريخ پيدايش يلدا و جشن ميترا به آن افزوده شد. نمای پشتی نقش برجسته ی میترا در موزه ی لوور پاریس. در این نقش ما خدای خورشید را در مرکز و بالای اثر می بینیم و در سمت راست او میترا مشعل به دست و در سمت چپ او خدای ماه دیده می شود. زیر آنها گاو است و زیر آنها دو نقش دیگر از میترای مشعل به دست در سمت راست با مشعل رو به پایین و در سمت چپ با مشعل رو به بالا. بعلاوه نقش مار هم در اثر هویداست که بر جايگاه ايثار نقش شده و در نقش سمت چپ بر دست میترا پرنده ای که پیک خورشید است دیده می شود.